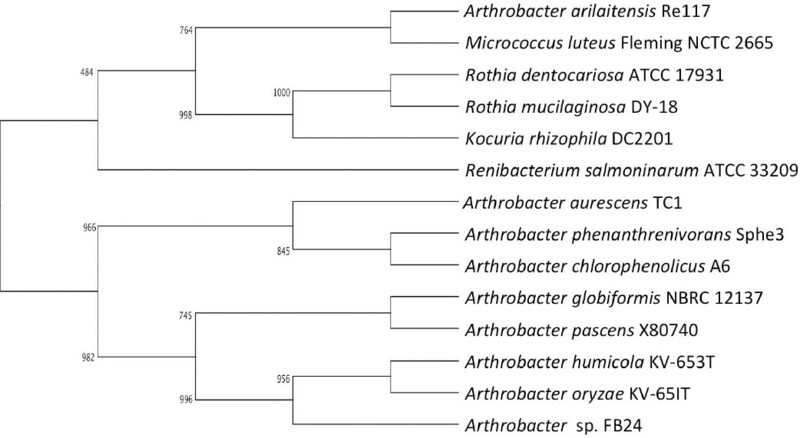 Arthrobacter sp. strain FB24 was isolated from a microcosm made from soil collected at an Indiana Department of Transport facility in Seymour, Indiana. This site was of particular interest because the soils were contaminated by mixed waste, both petroleum hydrocarbons and extreme metal (chromium and lead) levels . 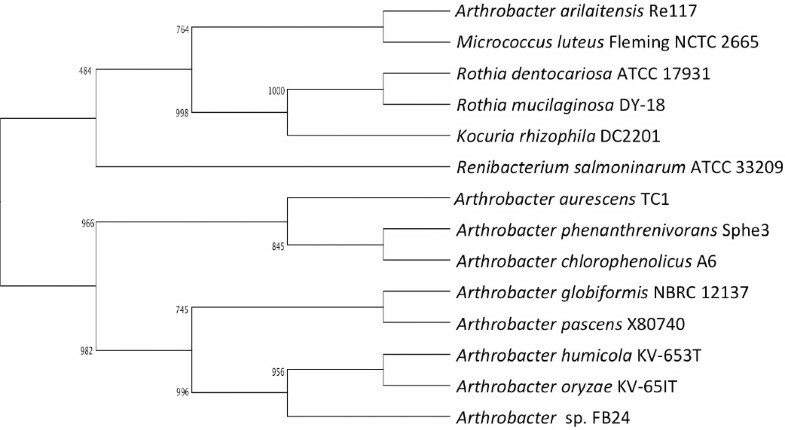 Details of microcosm enrichment and isolation procedures used to obtain the Arthrobacter strain have been described previously . This isolate was of particular interest because of its extreme resistance to chromate [3,4]. 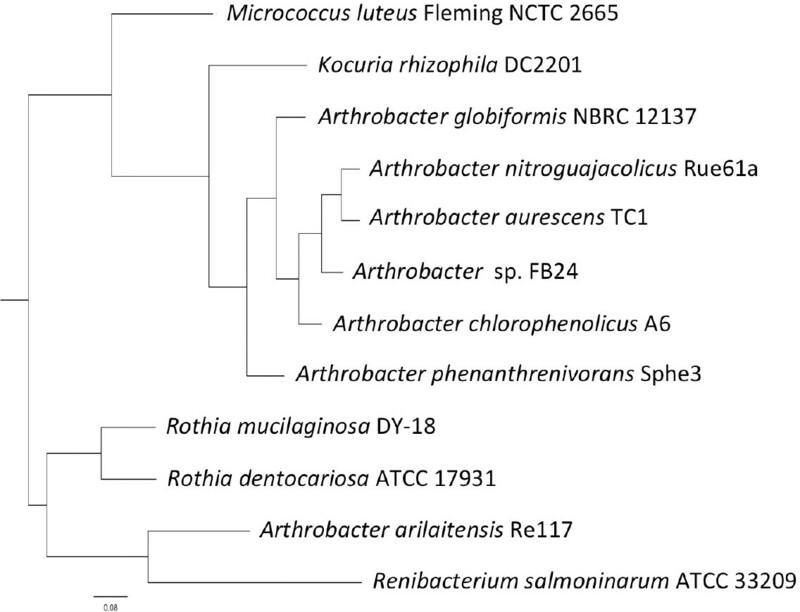 This work is a part of a larger study determining the compositional and functional diversity of bacterial communities in soils exposed to long-term contamination with metals [5–7]. 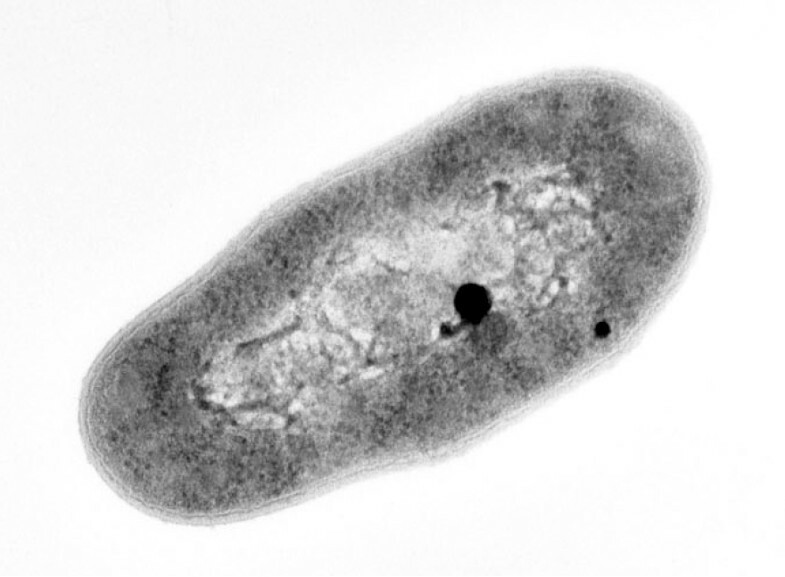 Transmission electron micrograph of Arthrobacter sp. strain FB24. Cells were grown in nutrient broth for 15 h (∼early stationary phase), fixed in 3% glutaraldehyde in 0.1 M cacodylate buffer, then fixed in reduced osmium, followed by a series of ethanol dehydration steps. Cells are then embedded in Spurr resin, stained with uranyl acetate and Reynold’s lead citrate. Image was captured on Kodak SO-163 film at 33,000× magnification. The FB24 culture used for DNA extraction was started from the glycerol stock (stored at −80 ºC) that was made from the original isolate. Cells were streaked onto a 0.1× nutrient agar plate, incubated at 30̱C, then a single colony was used to grow a culture in 0.25× nutrient broth (NB) (Difco, USA). Total genomic DNA was extracted from cells grown in liquid culture using the standard CTAB procedure . 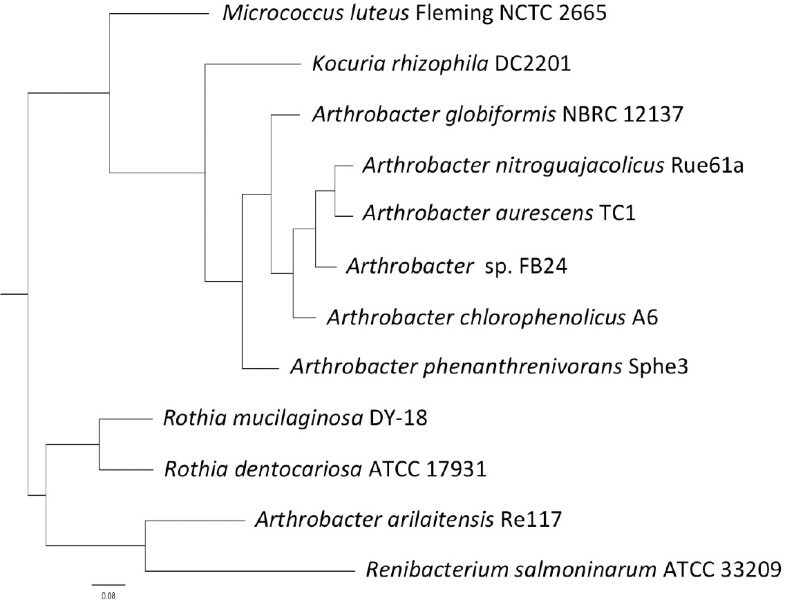 The 5,070,478-base pair genome of Arthrobacter FB24 is composed of a single 4,698,945-base pair circular chromosome and three large circular plasmids (96,488, 115,507, and 159,536 bp) (Table 3) with GC content of 65.5, 64.7, 63.3 and 65.0%, respectively. Based on a summary of genomic features listed on the Integrated Microbial Genomes (IMG)  there are 4,536 protein coding sequences identified, of which 3,279 (70.94%, Table 4) have been assigned to a COG functional category (Table 5, Figure 3 and Figure 4). 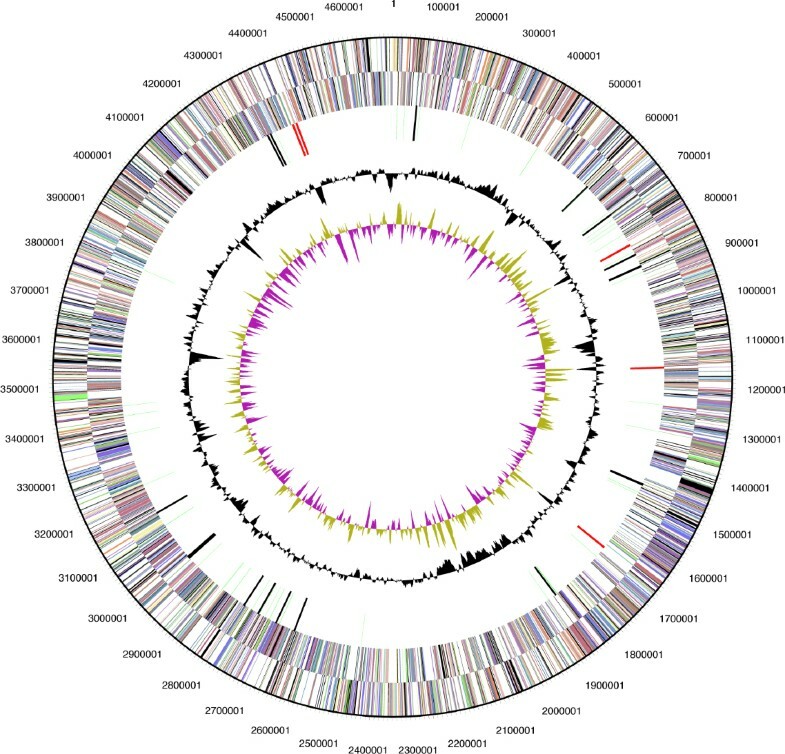 There are 1,257 (27.19%) predicted genes without an associated function.